Fed up playing the same characters all the time? 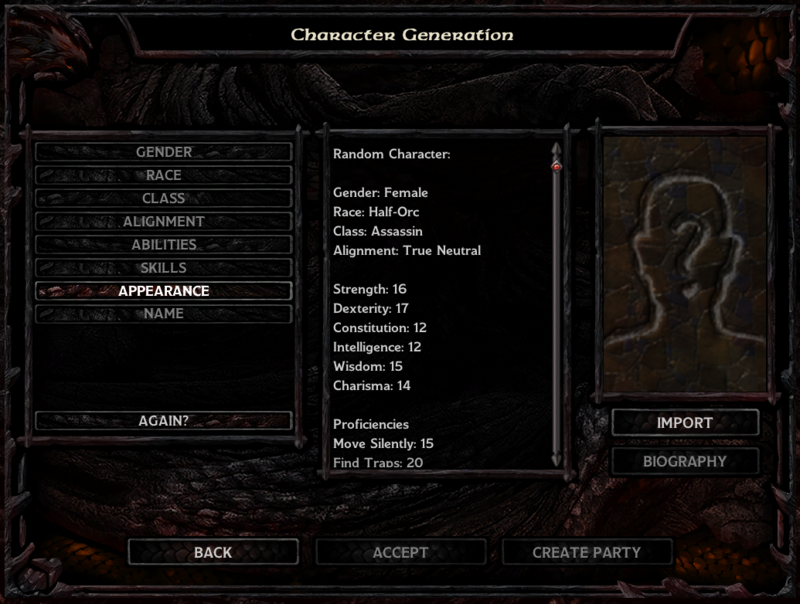 This mini-mod will let you generate a completely random character from all the options available. It pre-sets your abilities score to a minimum of 85, but allocates those points for you. It even chooses your initial proficiencies, skills & spells. - set your colours / voice. - choose a name for you. - Put the file M_random.lua into your override folder. Very cool... I'm a bit too scared personally to do this but I've known a lot of folks who really like to try new things, or step outside their comfort zone, or who don't like to reroll. This would be awesome for thos adventurous spirits. Very creative idea! This might just be the cure for restartitis! I set it at a 'minimum of 85' because for me, it's low enough to roll quickly and was just enough of a boost to a random character - who may end up with some otherwise crazy choices - without feeling unfair or like cheating. 1) Close your game. Go to your override folder. I wouldn't go higher than around 95 as for me that will roll within about 5 seconds but will pause until it achieves the roll (you can tell it's paused because the music stutters/stops until it finds the value). If you want a version you can edit on the fly IN GAME without editing this file each time, then drop me a message and it will be quick enough to make a custom version for you, but that's treading into autoroller territory which this mod is not. Nicely done. To be combined with the item randomizer mod for even more randomness. Hey @Iglosnof , I'm out at the moment but if you want I can take a look at what you've done. Send me a message with your UI.menu in a zip! Should I have had one in the first place? Glad we could fix that! No problems for this mod with 2.3 that I could see... ! This will definitely make starting a new playthrough more interesting! Thanks a heap to you @Mr2150 for putting your time, invaluable skills and effort into making this for all of us! Definitely loving this, thank you! E: Is there a way to mod this mod so that multiclass is excluded? enabled "randomCharacter == 1 and createCharScreen:GetCurrentStep() == 15"
It seems, clicking on the Random button ends in a deadlock at times. EDIT: I think, it is because I use LeUI. I think, "createCharScreen:OnGenderSelectButtonClick(2)" may be a wrong reference, because the Gender screen has been massively changed in that UI. The "Again" button does not show up in BG1EE+SOD, the check for "randomCharacter == 1" does never match, it's weird. But I have no knowledge about BG scripting, maybe it's a variable scope thing? It happens e.g. for half-elves in the mage spell picking. The "Done" button is only available if correct spells are picked, which never seems to happen. If you can do nothing you could still add counters to the while() loops so it does an emergency stop there. Your mod chooses "85" as a minimum abilities roll. The following replacement code chooses to emulate (my) human rolling Which means choosing the best roll and: a) Getting tired of rolling at 150 rolls b) chance (here 0-20%) of missing a good pick. --> enabled "createCharScreen:GetCurrentStep() == 0"
Button will be available at any step and the advantage is, e.g. YOU can decide about gender and race, your mod will decide the rest. So you get as much control as you want. Still random crashing for me on EET + LeUI install plus broken gender assigment. Any help, please? Here is an updated files that should fix the incompatibility with LeUI. (As a side effect, it will now randomize the spells selection even when using other UI). Working flawlessly, thank you so much!